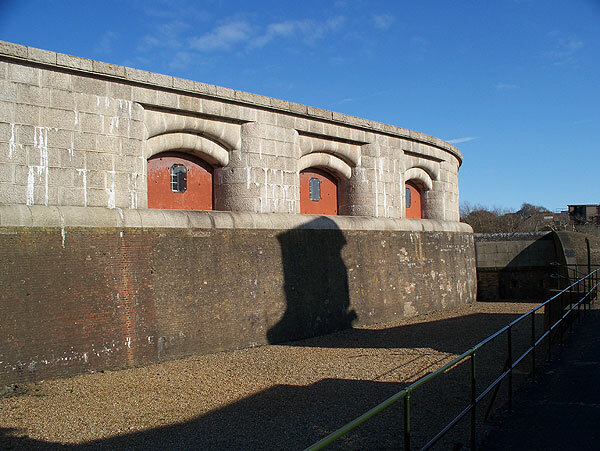 The Felixtowe Museum is housed in the old submarine mining building to the right of the Landguard Fort entrance. The exhibit rooms span a range of interests from the military to local social history. Rooms are devoted to seaplanes, naval matters, defensive mines, a local mental asylum etc. It is well worth a visit if you are visiting the peninsula. Check opening days before travelling, as the museum is manned by volunteers and the opening days seem limited. 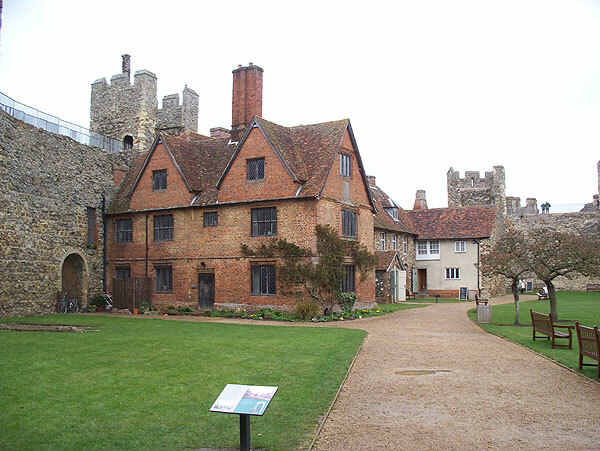 The castle was built in the 12th century by King Henry II. 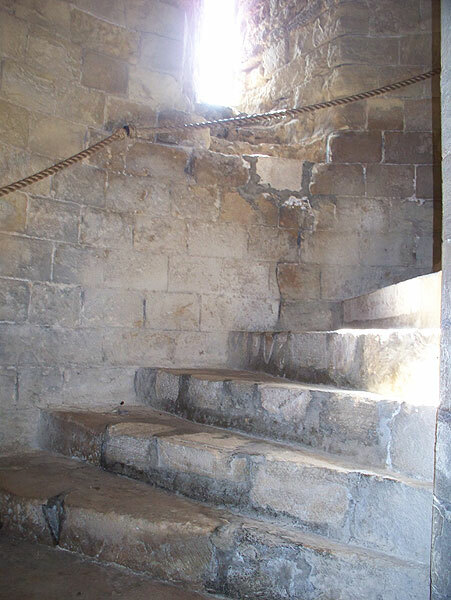 Its keep is of unusual design, being circular internally, with three flanking towers which contain the stairs and a number of chambers. 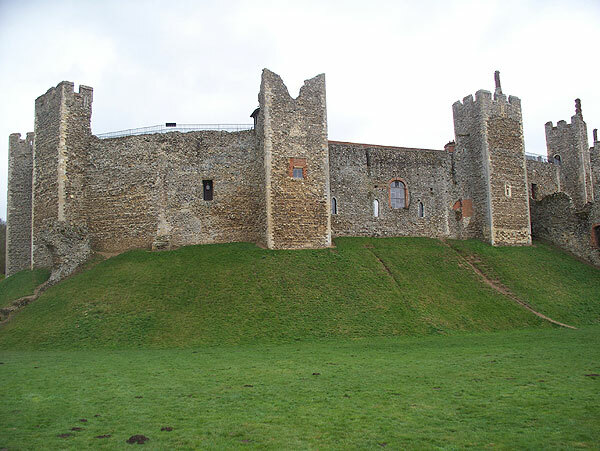 Originally it had a substantial outer wall with defensive towers, similar to Framlingham Castle, but this has entirely disappeared. The main hall is at first floor level, with another circular hall above. 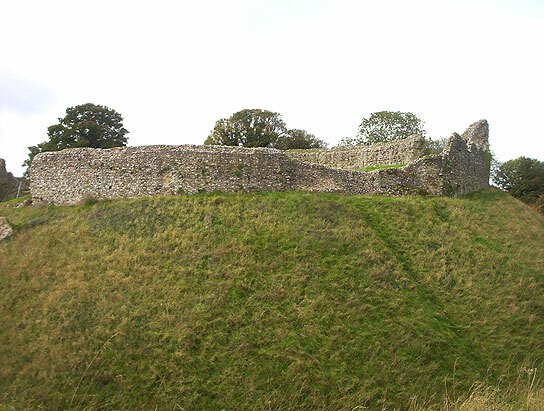 Unlike the outer walls, the keep is well-preserved. 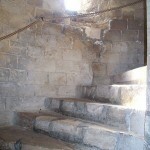 Stairs give access to a basement, various small chambers, and the roof. The roof towers contain a former bakery and guardroom. The flat roof is modern. The original roof was conical and hidden behind the upper walls. 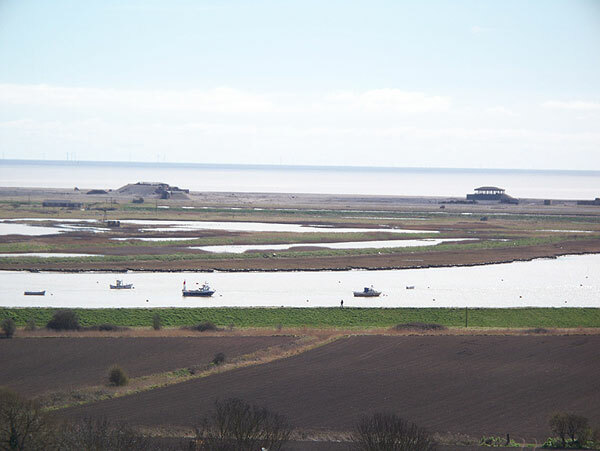 Fine views of Orford Ness, the countryside, and the town can be had from the roof. The castle makes an interesting visit. Visit time ~ 1.5 hours. 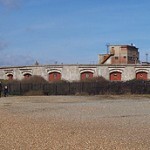 The Landguard Fort lies near the end of a spit of land near the Port of Felixtowe. There have been several forts on this site, but the present one is of 18th and 19th century construction, with a few 20th century additions. 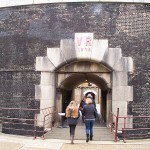 The 18th century fort was pentagonal, but two sides of this were replaced in the 1870’s by a curved bastion containing heavy guns, plus a semicircular building enclosing the centre parade ground. 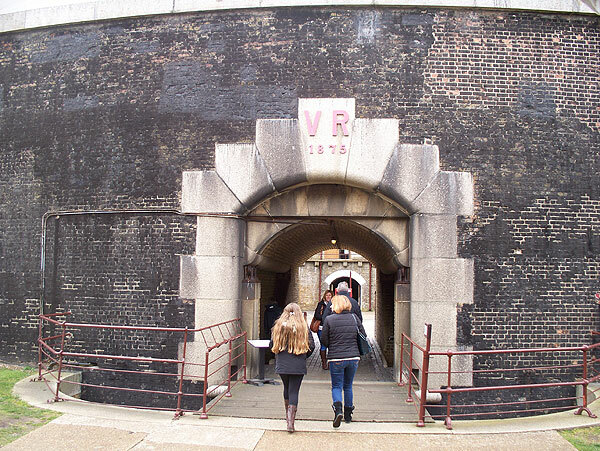 The fort has had various uses, including as a control point for mining the estuary in the Victorian period, as part of extensive port defences in WWI, and as a Fire Command Headquarters in WWII. During WWII the defences included 6″ guns. The fort’s usage declined after the war, closing by the 1960’s. The fort makes a very interesting visit. 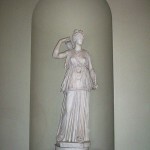 All parts can be explored, and an audio guide is available. One of the casemates contains a huge replica gun. Visit time ~ 3 hours. 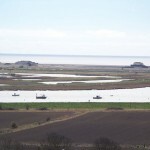 Outside the fort, the Felixtowe Museum occupies the former mining building, and the beach, visitor centre and nature reserve are nearby. The approach to the fort runs between the nature reserve and the modern Port of Felixtowe with its cranes and container ships. There is parking outside the fort and a little further on at the visitor centre. The parking can fill up at peak times e.g. sunny bank holidays. 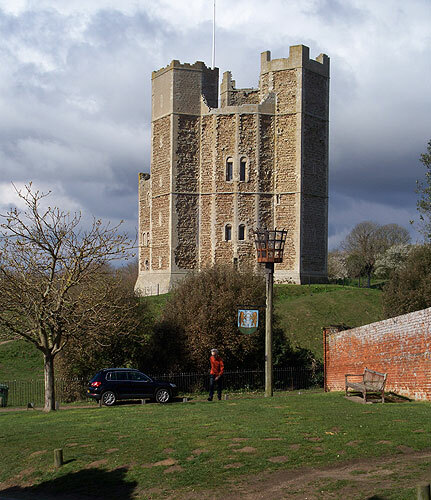 The castle was built by the Bigod family in the 12th century, and was home to earls and dukes of Norfolk for over 400 years. 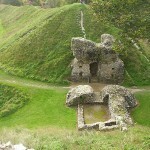 The outer walls and towers are well preserved, but the halls and domestic buildings within the walls have not survived. Inside the walls is a poorhouse built in the 17th century. 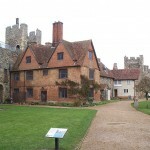 A number of decorated Tudor brick chimneys stand atop the walls. Most of these are purely ornamental. It is possible to walk around the walkway on top of the walls (anti-clockwise only), access being via the shop in the present Great Hall. This gives good views of the surrounding country. There is a public pay car park in front of the castle. The fee can be claimed back at the Castle ticket office. 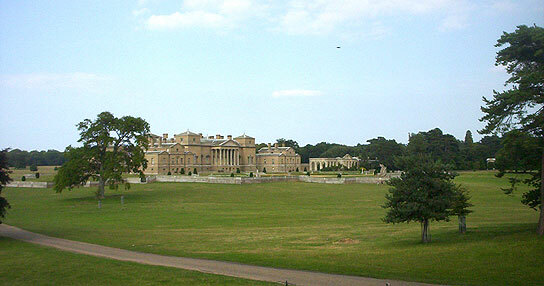 Holkham Hall and estate are essentially the creation of one man, Thomas Coke, who built it in 1734-1759. 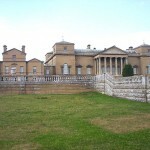 It is said to be one of the 10 best houses in England. 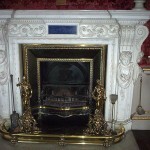 The house is built of buff-coloured brick from brickworks on the estate. First impression is that it’s big, and rather austere-looking. 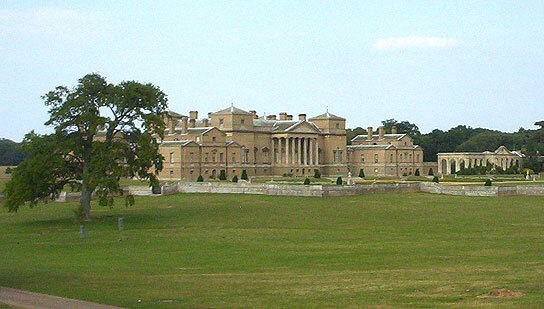 (think of Whitehall or the Bank of England parked in the Norfolk countryside). The central core is quite big, and then there are four symmetrically placed wings, plus the service courtyard. It seems that the house is meant to be viewed from the south. However today’s visitor approaches from the north-east past the service courtyard, and can only see the south front after a trek around the inner park. 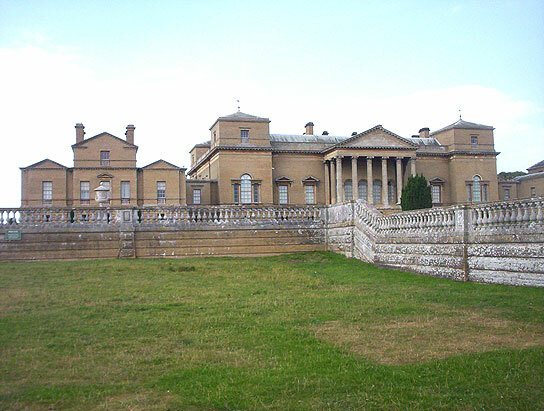 The house opening hours are quite restricted, and it can take 2 hours to go around the interior, so it’s as well not to be distracted by any outside exhibits, walks, tea-rooms etc. On entering, the visitor’s reaction is likely to be Gosh!! Look at that!! rather than “nice room”. This is said to be the most impressive hall in England, with alabaster walls, Roman columns, a double staircase, coffered cieling, semicircular vaults, bas-reliefs, side balconies, plasterwork, and lots and lots of gold-leaf. 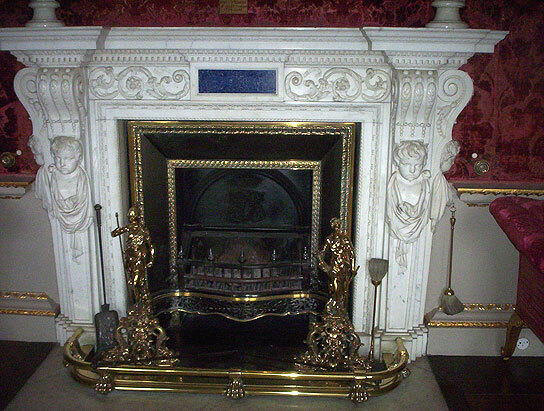 Several of the other rooms carry on the same theme, such as the sculpture gallery (with ancient Roman sculpture), the libraries (with Birds of America and scores of huge volumes of the Cosmographica, a medaeval world atlas, on the shelves), and the Drawing Room, Saloon and South Dining room all built and furnished to impress. If you stand in the right spot in the saloon you can see an enfilade right from one end of the house to the other, and at 90 degrees to that, a monument out in the parkland to the north, and another to the south, both on the axis you’re standing on. 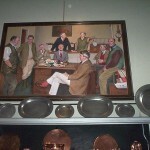 Paintings are well represented, and some are by famous artists, and some are big (or both). The tour ends in the Old Kitchen, in one of the wings – a room big enough to swallow the whole of my house, and probably some of yours as well. Unusually, the hall has never suffered major alterations, or sales of contents, and still belongs to the Cokes, descendants of the builder. 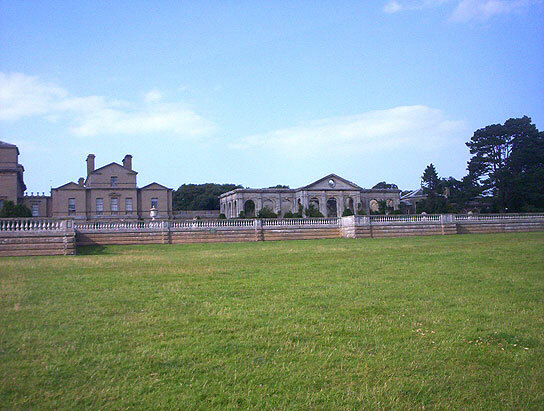 Outside, there’s the the park and the estate, which stretches to the sea, a walled garden (which I didn’t see), and outbuildings, and some private gardens. Around the service courtyard are the ticket office, tea-rooms and some exhibitions. The Bygones exhibition (a chargeable extra) containing various artefacts and vehicles, is interesting, but could be skipped if you’ve seen that sort of thing elsewhere or are short of time. 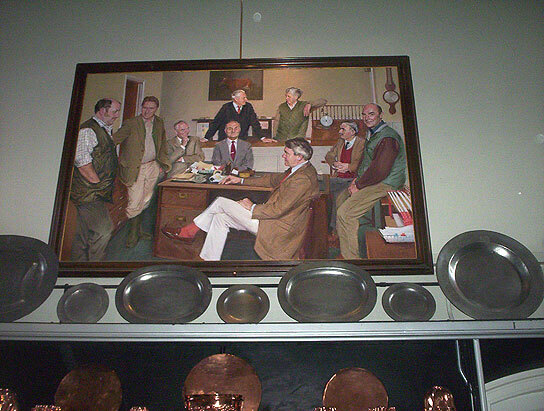 The history of farming exhibition (free) is quite interesting. It’s worth asking what discounts are available, as with parking (£2.50), guidebook (£6) etc a visit can become quite expensive. 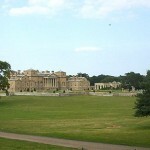 I arrived arround mid-day, but Holkham is a suitable destination for an all-day visit. 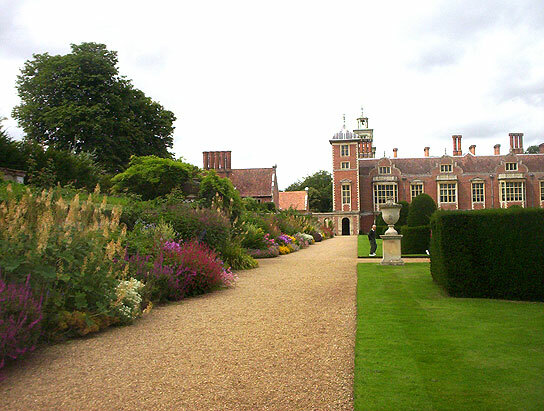 Felbrigg is an old Jacobean house with a later extension, and attached service buildings built around a service courtyard. 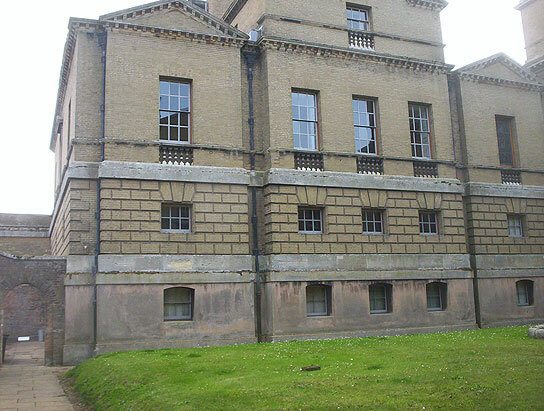 It is noticeable that the older wing is built of a patchwork of brick, flint and limestone, with a largely weathered coating of plaster, while the newer Classical wing around the corner is in immaculate brick with sash windows. 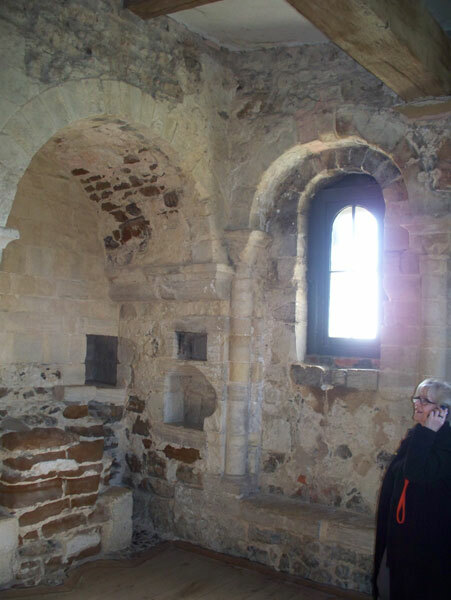 The Jacobean wing has a parapet pierced with the giant-sized lettering GLORIA DEO IN EXCELSIS. 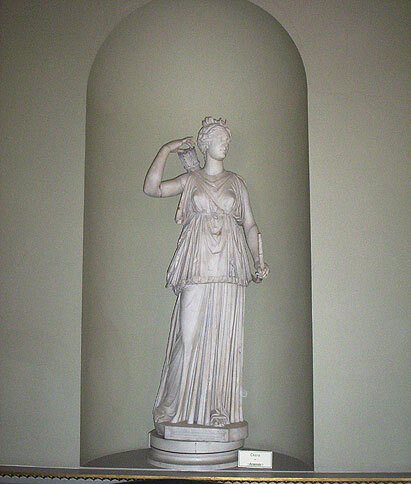 Inside, many of the principal rooms have fine plasterwork by Edward Gouge. 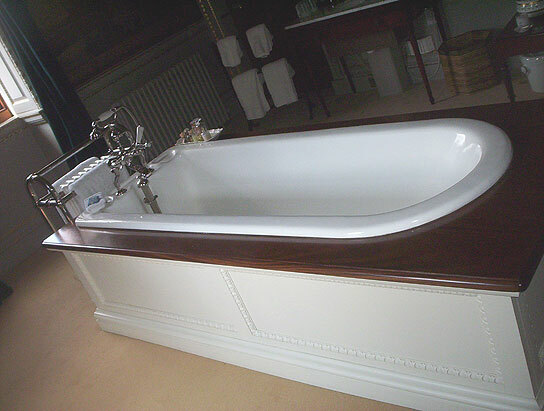 A tour of the interior starts with the grand rooms on the ground floor and proceeds upstairs to the principal bedrooms and the Chinese Room, passing the bathroom and descending by the back stairs to the service areas and a corridor with taxidermy collection. The tour continues along one side of the square of service buildings to exit near the reception. 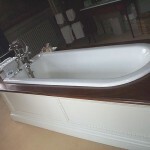 There are a number of attractive rooms and interesting contents. Outside, I had a look at gardens near the house and the Orangery, before making my way through a mini woodland behind the house towards the walled garden. 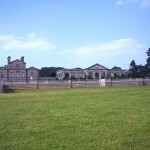 The large walled garden (next to the car park) is worth seeing. There are several walled sections, some mainly grassed and some highly planted, and a Dove-house here. An un-documented feature is that the grassed section nearest the gate shows the ghost of a previous formal planting on the aerial view. Parking is free (for NT members). 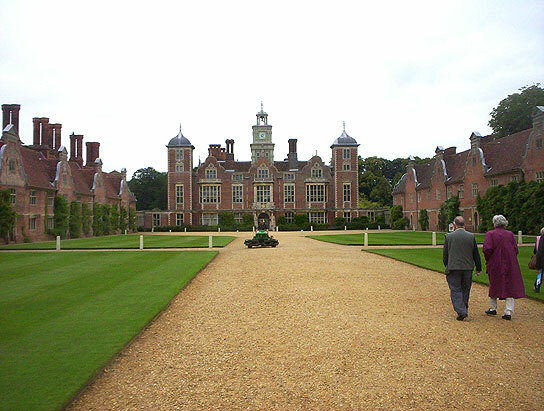 It’s possible to visit Blickling Hall and the nearby Felbrigg in one day. 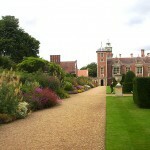 If so doing, it’s advisable to start with the Blickling gardens at around 10am, and to devote more time to Blickling, which is larger and has more to look at. There was a house here in the 15th century, but the current Blickling Hall was built on the ruins of the old Boleyn property in the reign of James I, by Sir Henry Hobart. It is a large Jacobean red-brick house with two internal courtyards. The library at Blickling Hall contained and still contains historically significant collections of manuscripts and books. Outside, there is a formal parterre to the east, and elsewhere a Wilderness garden, a Secret garden, lawns, a kitchen garden, and a large yew hedge on the approach to the house. 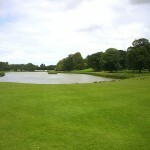 The wider Park comprises 450 acres of parkland, and beyond that is an estate of 3500 acres of farmlands. Unusually the service wings, attractively constructed in red brick, are in front of the house, and to either side of the large front lawn. 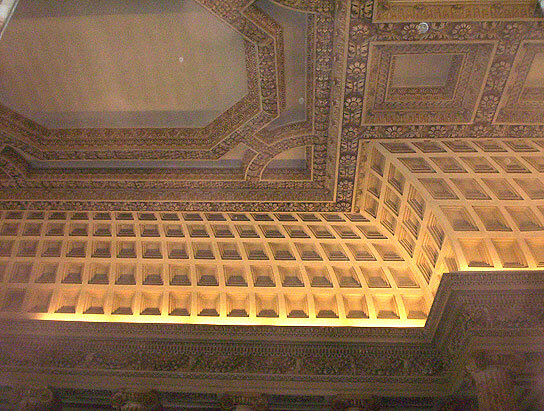 It looks quite impressive, and there is a lot to see inside, with about 18 rooms open to visitors, and quite a lot of interesting contents and impressive plaster ceilings. 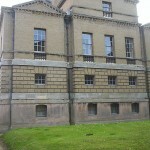 The Long Gallery is 123 ft long. 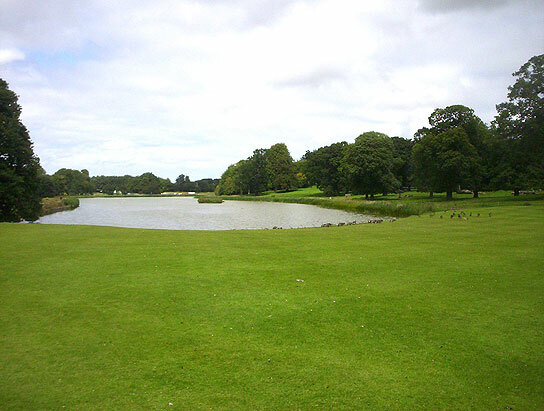 Outside, I explored the large informal gardens with trees and an Orangery etc, and the formal garden. The large park was big enough to completely lose the preparations for an open-air concert scheduled for the evening of the day I visited. I didn’t see the RAF exhibition. Parking is free (for NT members). This is the only surviving remains in England of a priory of Canons of the Holy Sepulchre, who aided pilgrims to Christ’s tomb. 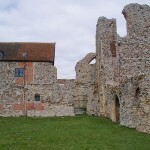 The ruined nave of their 14th century church was later used as a barn. Sat-nav can take you to Canons Close in a housing estate, where the back of the site is at the end of a short cul-de-sac to the right. If you arrive there, you may as well look, but a better view can be had from the other side, on the A134, where there are one or two interpretation panels. 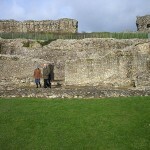 The walls stand to near original height. 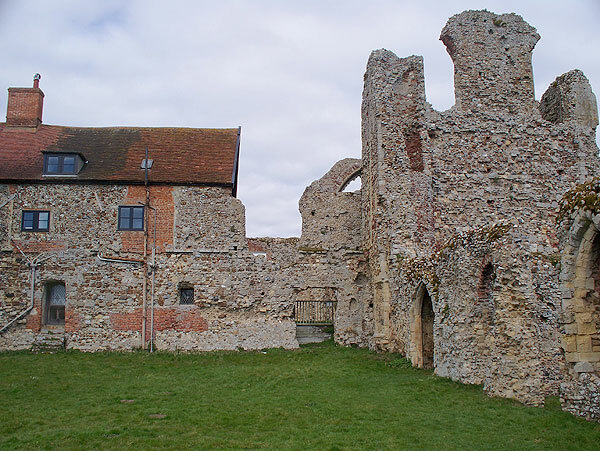 There are three separate attractions in Castle Acre, but as one would hardly travel to look at one without checking the other two, I’ll deal with all three here. 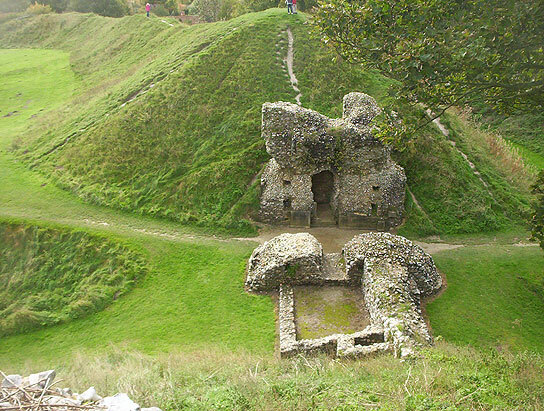 Castle Acre Castle: Founded in the 11th century as a stone built country house, it was progressively converted into a strong keep, defended by stone walls and surrounded by immense earthworks. The castle is now much ruined but the scale of the earthworks and baileys is impressive. 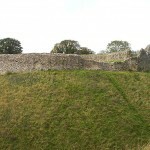 Castle Acre Village and Bailey Gate: At the same time that the castle was being fortified, a planned town was being built alongside, protected by earthwork defences and stone gatehouses. 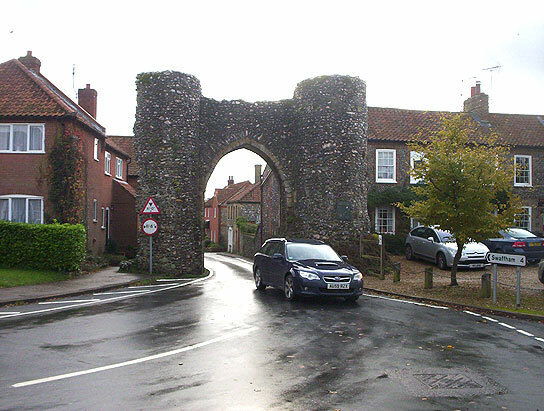 The north or Bailey Gate still survives, with the village street running between its towers. The village streets have some older buildings, and the ancient street layout can still be traced. 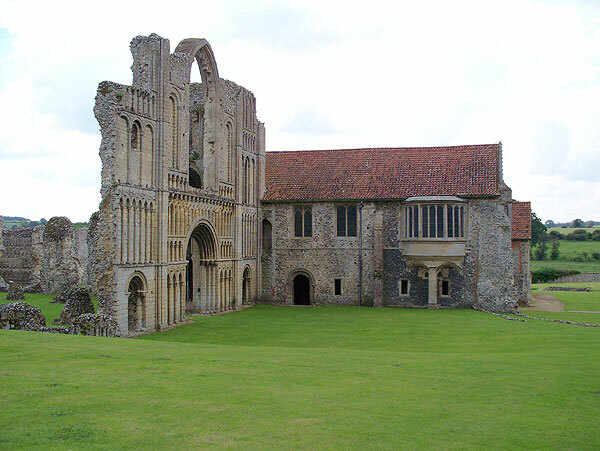 Castle Acre Priory: This is one of the largest and best preserved monastic sites in England, founded around 1090. 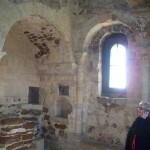 The remains of the church have interlocking round arches. The west range of accommodation is virtually complete and full roofed, and includes a chamber sumptously revamped in Tudor times. 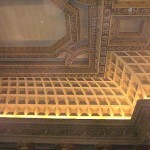 There is a lot to look at, including exhibitions. 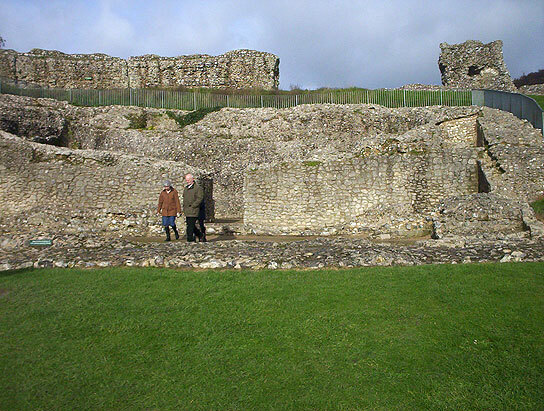 If you visit the EH Castle Acre Priory website, you can download maps and walking routes for the Priory and the castle and town. 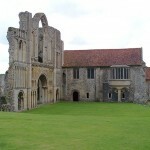 Update 2012: The Priory is well worth a visit of an hour or two. A free audio guide is available which is almost too verbose at times – you should probably listen to the first two items before leaving the Visitor Centre. 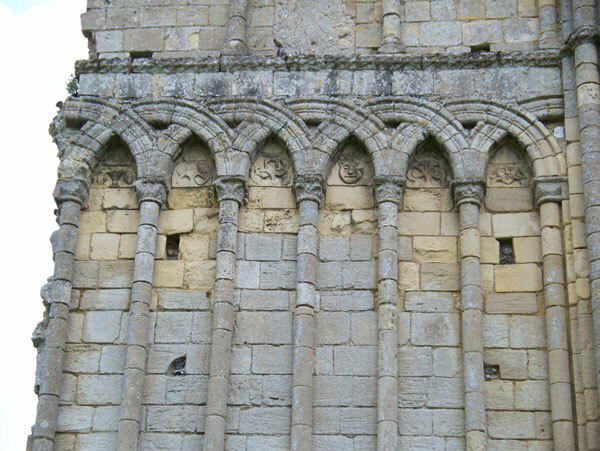 It is clear that the buildings were very fine before they were stripped of cut stone and other valuable materials at the Dissolution. 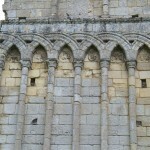 Most of the West Front with its carved stone still survives. The Prior’s lodgings which formed a useful residence after the Dissolution are still roofed and relatively complete. 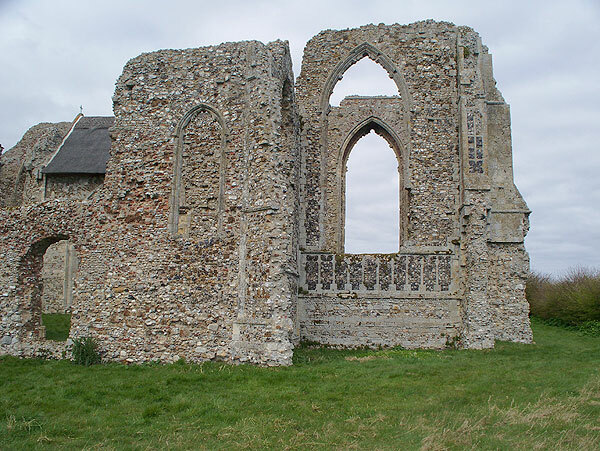 The Priory is about ¼ mile west of the village – turn left on exiting uphill at the Bailey Gate.